There are situations where you might want to change the default form field labels, messages or buttons in Paid Member Subscriptions to better match your membership site profile. 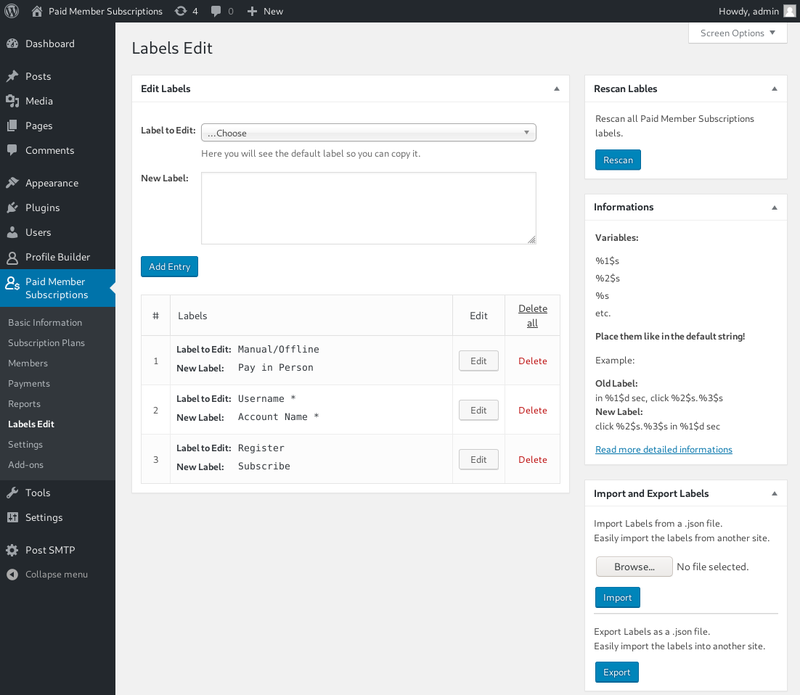 We now offer the ability to edit any label coming from the plugin through the Labels Edit add-on. This is a free add-on which is available in all Paid Member Subscriptions versions. Using it you can easily modify any label without having to write any code or alter the core plugin files. We use the word ‘label’ to describe any string or message that is coming from our plugin. The interface is similar to the one from the Labels Edit add-on for Profile Builder, so if you’re already familiar with that setting up labels will be a breeze. You can see the edits you already made to labels, modify or remove them. The labels you setup can also be exported or imported, so it’s easy to move them between websites. You also have the option to rescan the plugin for strings. This option should be used when a string is coming from the plugin but you cannot find it in the dropdown. Some strings might also contain a placeholder which is going to be replaced with certain data when it’s rendered (e.g. the current users name). This method of editing the labels supports these variables so you need to be careful to add them in your modified label, like they were added in the default string. Old label: You are currently logged in as %s. New label: Hello %s. You are now logged in. Note: The variables can be moved, they don’t need to keep their original position. For more information, visit the documentation page. If you have any suggestions or other type of feedback, either leave a comment below or open a ticket via our support page.